Email has been around since the early 1990's, which for some of us, doesn't seem that long ago. Email really surged in popularity due to its use in corporate networks (Outlook, Lotus Notes, Groupwise) and for personal accounts with early tech start-ups such as Hotmail and Yahoo leading the charge. Who can forget the headlines when Microsoft bought Hotmail for $400 Million dollars in the lead up to the tech boom? What's not to love about email, right? They're "private", so only the sender and recipients can see it. They appear almost instantly and can be used to plan your work day. 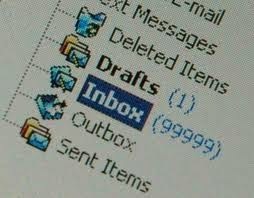 You can typically see which emails you have read, which remain unread and which ones can be stored for later reference. Who hasn't gone to the deleted items and found a hidden gem of an email that gets you out of a sticky situation? All hail the email! However, there is a major problem with email, and it actually relates to all of the things we love about it. In a way it is too popular, too pervasive, and as a result, it's too damned hard to find anything! On a broader scale, the private nature of email means that unless you use a long list of CC and BCC recipients, your valuable communication is locked away, and potentially lost forever. This is particularly troublesome in project teams or any environment where information sharing and collaboration are key requirements. Who hasn’t spent hours searching for the right email, with the right attachment version, or requesting a copy of this email or that email or even forwarding sent email to recipients accidentally left of the email CC fields. It's mind numbing and frustrating. UniPhi is already known for its focus on transparency and as an enabler of cross functional collaboration. Did you know that UniPhi also features an add-on utility which integrates seamlessly with Microsoft Outlook, ensuring that all team members have access to important information? With UniPhi, for the information to be sent and shared, an email technically doesn't have to be composed and sent in the traditional way. UniPhi users update project related information, assign issues and tasks, contribute to conversations, and generate document, and reports. All of this information is then able to be emailed from UniPhi, to email recipients, effectively informing the project team and stakeholders of change to the project. thus ensuring that all people involved in the project will know what has changed and why. The level of integration UniPhi’s software has with Outlook promotes transparent communication which is vital to the successful completion of any task or project. The transparency of the application means that the emails generated and sent out to teams and stakeholders have context. Everyone can see what project the issue or task is related to, who assigned the issue and its due date and so on.